Visual communication – the act of making your point through images – is one of the most important skills that every digital marketer and social media savvy business, should adopt. The way people consume information is changing rapidly each and every day. With the rise in mediums such as blogging, live-tweeting, and video streaming, the way you reach your audience is never going to be the same again. 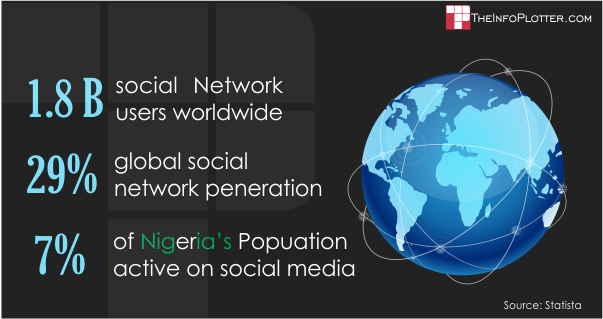 Over 1.8 billion people now have active social media accounts. That’s more than 29% of the world’s population. In Nigeria, it’s 7% of the population. But people aren’t just turning to social media to share selfies, complain about Lagos traffic or boast about their latest workout (because if you didn’t tweet it, it didn’t happen, right?). Instead, they’re using their feeds to gain access to the news that matters to them. Since 2013 alone, 50% of Facebook and Twitter users have used the platforms to access news, “snacking” on the stories that interest them, instead of having their content consumption driven by what’s on screen, or in the newspaper. You can’t even feel safe in the knowledge that the old guard of consumers are still waiting to read your columns in print. Because, believe it or not, the fastest growing demographic on Twitter is the 55 to 64 year olds, which has grown 79% since 2012. So what does this mean for Digital Marketers and social media savvy business? It stands to reason that if people are changing the way the consume information, you also need to change the way you present it to them. 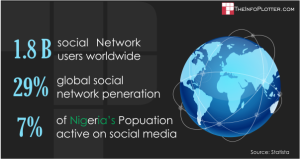 In Nigeria today with 38% (70.3 Million) of the population active on social media, it practically seems like a new blog is created everyday and sooner, an information consumption revolution is just waiting to happen. The Internet, then, has become a shouting match. And it’s no longer about who shouts the loudest; it’s about who shouts the smartest. So how do you do that? That’s where visual communication really comes into it’s own. It’s no longer good enough to just create useful content in your niche. 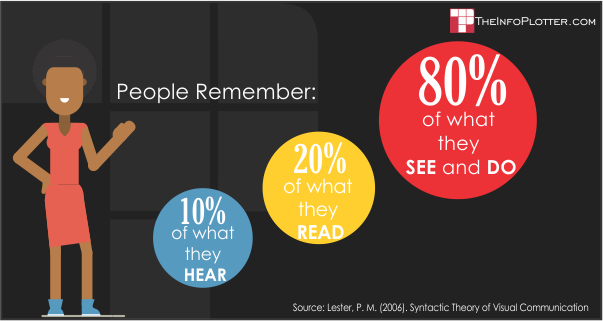 You now have to make sure your audience: stay on your page, share your article, care enough to comment and, most of all, remember what you said: all benefits that visual content can give you. 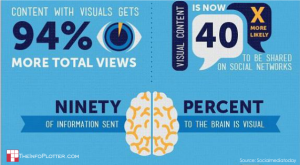 It’s the era of featured images, infographics and in-article snapshots. Take this article, for example. You almost definitely can’t remember the opening sentence. But, you could recite most – if not all – the facts and figures on the images so far. Yes, visuals stick. If your images are relevant to your text, communicates the points you’re making and contain the key information you’re trying to get across, the bigger the impact on your audience. Images are also able to reach further into different types of article readers and appeal to their needs. For example, “serial skimmers” -readers who look at articles for: quotes, headings, media and conclusions — are better engaged when you provide fact-based images throughout your article to grab their attention, and impart the information they need to take away. Which brings us to the final piece of the online puzzle – traffic. Getting people from all over the Internet, and the world, to read your articles, take note of what you’re saying and most likely sharing it. Research by BuzzSumo, an online content marketing tool, discovered publishers that use Infographics see traffic that’s 12% higher than those that don’t. In fact, it seems in the social age, images are almost a requirement from readers, for them to even consider reading your article. Studies show that content with visuals get 94% more total views and visual content is 40 times more likely to be shared on social networks. When it comes to social sharing, visual content also has an unprecedented power that the written word can barely come close to. The simple answer is that you don’t need to be a budding Da Vinci to create images and graphics with all these benefits. You may take advantage of professional DIY Design tool available online. However, it’s always good to know what makes something look appealing to your readers, because what looks good to you and what looks good after you’ve hit the publish button can often be two vastly different concepts and it may just be important to engage a professional to help you visualize your message.